Baked Spaghetti and Cheese Recipe - he took one bite and said this was better than any mac and cheese I've made! 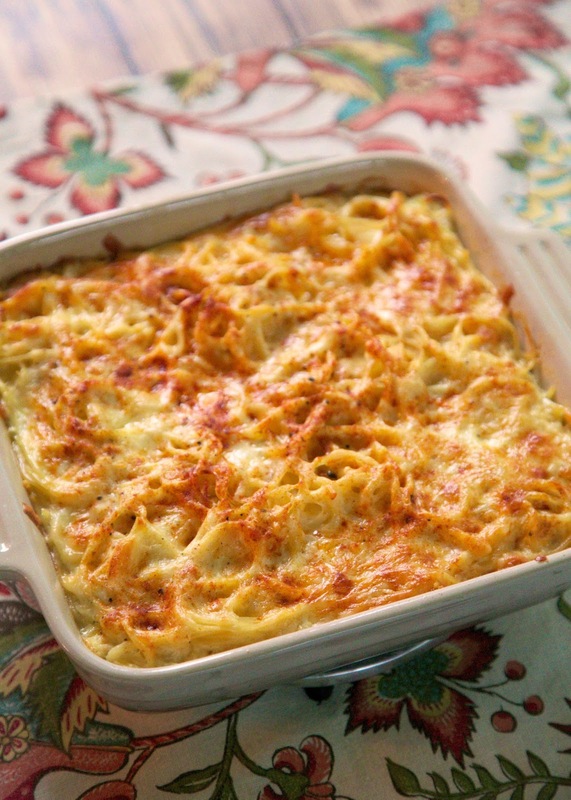 Spaghetti, Monterey Jack cheese, flour, dry mustard, milk and eggs - just whisk it all together and bake. Easy side dish or could even be a meatless main dish! I am always on the lookout of new side dishes. I get tired of the same old things. I came across this Baked Spaghetti and Cheese recipe in one of my old Southern Living cookbooks and decided to give it a whirl. I am so glad I did. It was delicious! Chicken Legs said this was so much better than traditional macaroni and cheese. This was super easy to make and it doesn't require making a white sauce. Just mix everything up and pour it over the spaghetti and cheese in the pan. Feel free to mix up the cheeses. I think cheddar and some pimentos for a Baked Spaghetti and Pimento Cheese would be fabulous! Preheat oven to 350ºF. Lightly spray a 9x13-inch pan with cooking spray. Place half of the cooked spaghetti in the pan. Top with half of cheese. Repeat layers. Combine flour, salt, dry mustard and pepper in a large bowl. Whisk in 1 Tbsp of milk (this will keep the lumps out). Add remaining milk and eggs, whisk until well blended. Pour over spaghetti mixture. Dot with butter and sprinkle with paprika. Bake for 45 minutes, or until set. All images and text ©Plain Chicken, Inc. This looks soooo good! 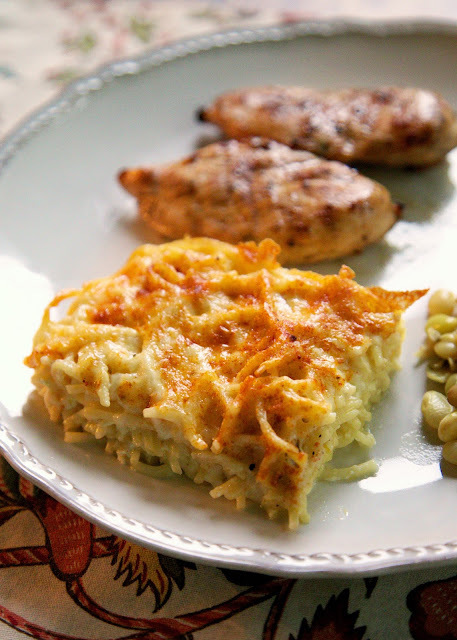 My son doesn't like mac and cheese, but I think he may like this, especially using the Monterey Jack cheese. We'll give it a try 'cause I KNOW I'm going to like it!! Thanks for sharing! This looks delicious! Can't wait to try it! I recently had a a similar dish at a "home cooking" style restaurant and I ate mine and most of my husbands too! I was thrilled to see your recipe only a few days later.... Grating cheese right now!! I was expecting to see the usual "baked spaghetti", never even thought about something like this as a side dish but it sounds great! Noted! Mine was a little too milky tonight. Do you think it would be a problem to reduce the amount of milk? My mother used to make macaroni & cheese with spaghetti when she was out of elbow macaroni. We always thought it was a treat. I can't wait to try this. We worked outside of New Orleans for a couple of years and one of the ladies we ordered lunch from had this kind of spaghetti as a side with fried chicken and it was so good! I have been trying to find a recipe for it and I think I just did...thanks!